2. USERS: Access and/or use of AGENCIA EFE sites implies the condition of user and that, by means of the mentioned access and/or use, the General Conditions of Use contained herein are accepted. 3. INTELLECTUAL AND INDUSTRIAL PROPERTY: AGENCIA EFE itself or as grantor, is owner of all intellectual and industrial property rights related to its web pages, as well as the content elements thereof: for example and not limited to, images, sound, audio, video, software, graphics, photographs and texts, brand and logos, color combinations, structure and design, selection of materials used, computer programs required for its operation, access and use, etc. All rights reserved. Under the current Law on Intellectual Property, the reproduction, distribution and public communication of the content of this web page for commercial purposes is strictly prohibited in any format and by any technical means, without the expressed and written authorization of AGENCIA EFE. 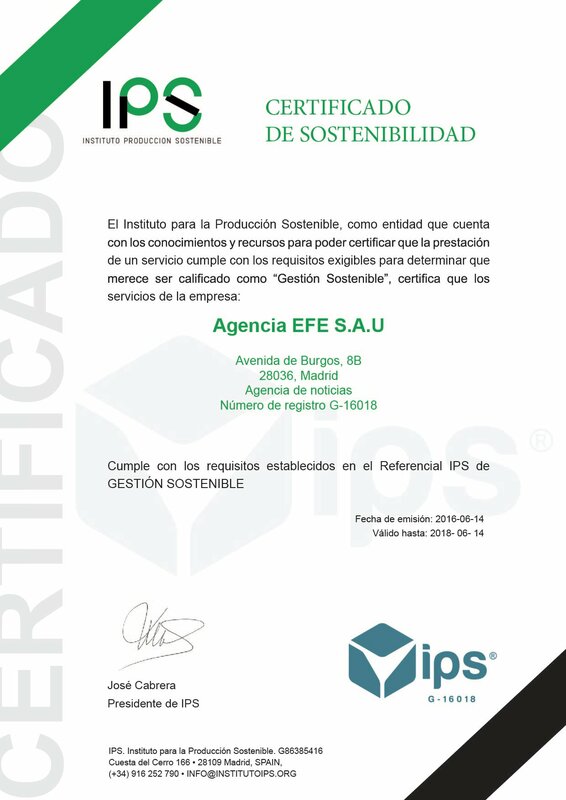 The User is obliged to respect the Intellectual Property Rights of Ownership of AGENCIA EFE. The User shall be permitted to view the elements of the various websites, and print and store them on the hard disc of his/her computer or any other media, provided that this be solely and exclusively for his/her own personal and private use. The User may not delete, alter, elude or manipulate any protection device or security system that may be installed on the pages of AGENCIA EFE. The unauthorized use of the information contained on this website, the re-sale thereof and the breach of the intellectual or industrial property rights of AGENCIA EFE shall give rise to those responsibilities established by law. 4. DISCLAIMER: AGENCIA EFE, who makes all efforts to ensure that the content included on this website is trustworthy, shall not be held responsible, in any case, for the harm or damages of any nature that may be experienced by the user due to errors or omissions in the content, integrity, accuracy, opportunity, lack of availability of the portal or the transmission of a virus, despite having adopted all those technological means possible to avoid it. Both access to the website and the unauthorized use that may be made of the information contained therein is the exclusive responsibility of the person who performs such action and AGENCIA EFE shall not be held responsible, in any case, for harm or damages that may arise from the above-mentioned access or use. 5. AMENDMENTS: AGENCIA EFE reserves the right to make, without prior notice, those amendments deemed appropriate to its websites. It shall be able to change, delete or add to both the content and services provided via the websites, as well as the manner in which these are presented or located on its websites. 6. LINKS: In the event the websites contain links or hyperlinks to other Internet sites, AGENCIA EFE shall perform no kind of control over the mentioned sites and their content. Under no circumstances shall AGENCIA EFE assume the responsibility for any of the content of any link leading to another website, nor shall it guarantee the technical availability, quality, trustworthiness, exactness, extent, veracity, validity or constitutional nature of any material or information contained in any of the mentioned hyperlinks or other Internet sites. Furthermore, the inclusion of these external connections shall not imply any type of association, merger or partnership with the connected entities. 7. LINKS TO THIS WEBSITE: All third party links included in this website must lead to their homepage. “Deep links”, “framing” and any other use of the content of the website in favor of unauthorized third parties shall be expressly prohibited. 8. GENERAL: AGENCIA EFE shall prosecute the breach of these conditions of use, as well as any undue use of its content may result in severe criminal and civil penalties to the maximum extent permitted by law. 9. AMENDMENTS TO THESE CONDITIONS AND TERM: AGENCIA EFE shall be permitted to amend, at any time, the conditions established herein, being duly published as they appear herein. The validity of the mentioned conditions shall be based on their exposition and shall be valid until they are amended by other duly published conditions. 10. APPLICABLE LAW AND JURISDICTION: The relationship between AGENCIA EFE and the User shall be governed by current Spanish Law and any controversy arising therefrom shall be dealt under the jurisdiction of the Courts of the city of Madrid.